The misleading optimism of sustainable design projects. One artist is taking an unusual amoral perspective on pollution. Samples of Shahar Livne’s litho plastic, composed of recycled plastic and industrial waste. At this year’s Dutch Design Week, Shahar Livne, a recent graduate of Design Academy Eindhoven, presented work made of recycled plastic. This was not, on its face, unusual. After all, the theme of this year’s fair was “Good Design for a Bad World,” so Livne’s work was not alone in crafting goods made from humanity’s castoffs. There were porcelains made from post consumer waste, terrazzo furniture made from recycled glass, even scarves dyed with ink made from carbon emissions. What these projects had in common was that they all presented a solution as to what to do with that waste. Or, short of that, they served as an alarm bell or a call to action. Livne’s project was different. By comparison, it seems fanciful. 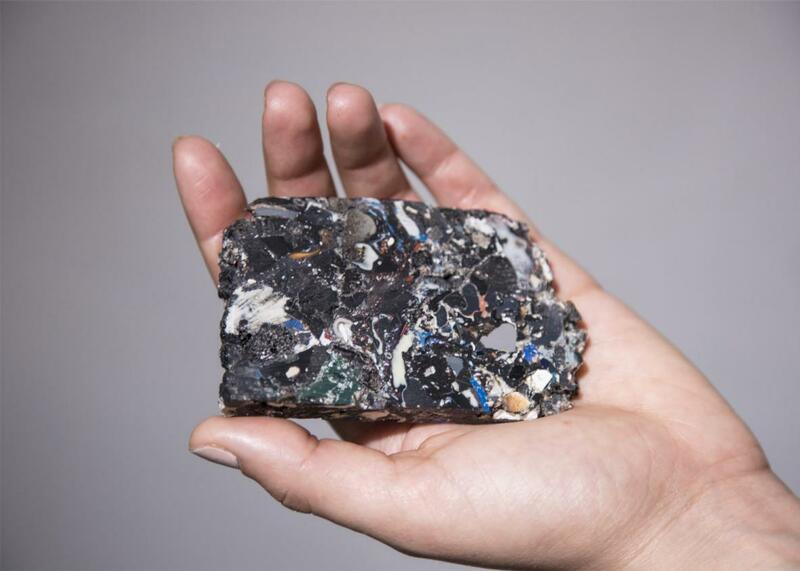 A work of speculative design, it explores the possibility that, as plastic waste further permeates Earth’s surface, it could one day blend with geological matter to become entirely new material. This is, to some extent, already happening. In 2014, geologists on an oceanographic vessel discovered rocks on the beaches of Hawaii formed of sand and coral and plastic waste, with entire toothbrushes and plastic bottles entombed inside them, like the wings of a prehistoric dragonfly. They dubbed these new rocks plastiglomerates. 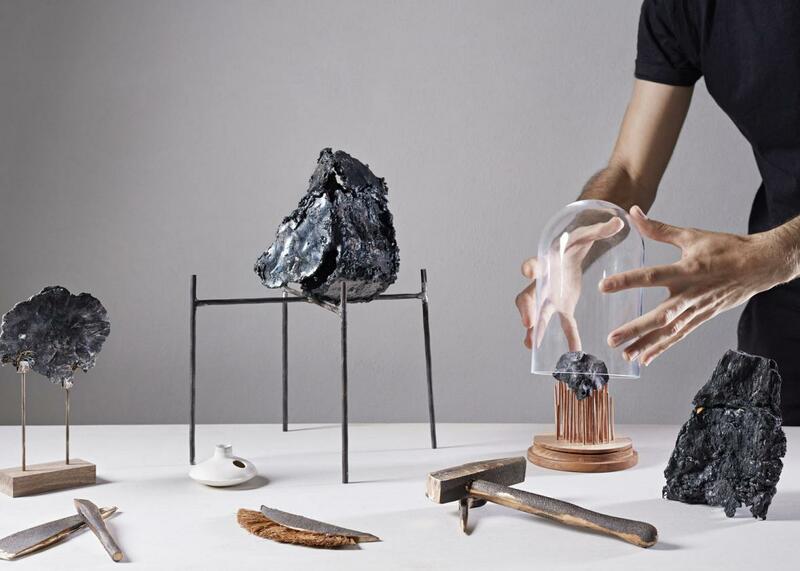 Livne imagines that, as petro-based plastics fall out of favor, future civilizations might value their remnants as something rare and beautiful, even nostalgic. This amoral perspective on pollution is unusual but more honest. To paraphrase her artist’s statement, nature does not make distinctions between wrong and right. Earth is indifferent to whether it composes a new layer of rock from the bones of the dinosaurs or the detritus of late capitalism; extinction is extinction, and the planet will go on without us. The more pertinent question for designers, then, is not how we can save the world, but how much will the world save of us. Livne said that, at first, design-fair attendees assumed her project was about recycling. Given the preponderance of such work at the fair, and its consumer-friendly optimism, this was admittedly not a bad assumption. But when people realized Livne’s actual aim, their reactions changed. Still others took the opposite perspective. Wasn’t it far too optimistic, they asked, to think any civilization would even be around to mine our old garbage? Wouldn’t we kill ourselves off before then? But these divergent reactions share an underlying resistance to art that accepts, rather than claims to reverse, the irrevocable changes we have made to Earth. This is against the norm in the design world in particular. It has become de rigueur to believe that good design can save us. H&M, the fast-fashion leader, is making evening gowns from garbage. One market-research group projects that reusable water bottle sales will hit $10 billion by 2024. Reformation’s “cool girl” clothes come with a tally of the carbon you saved buying from them instead of their competitors. The Ellen MacArthur Foundation is working toward a theory of “circular design” in which design can modify human behavior to be seamlessly sustainable. These models can range from a cloth diaper with compostable inserts to beer brewed from surplus bread, but all include ways in which waste is whittled down to a minimum, in the case of the beer, or even made into a positive, in the case of the diapers. All of these companies, regardless of their underlying innovations, assume a kind of frictionless transition to carbon-neutral consumerism. They are easy to support because they require no real imagination—they offer a vision of a future that is not discernibly so different from our present, one in which we simply swap our Hanes for undershirts made of recycled fabric and bask in the feeling of moral superiority. But more to the point, they all assume that human beings can design our way out of climate change. They presume that we as a species can control our environment, rather than the reverse. Livne’s work echoes that of Paul Kingsnorth, the self-proclaimed “recovering” environmentalist. He identifies this focus on control and hope as a kind of security blanket. What we need instead, he argues, is the bravery to accept the dire reality of our situation and to mourn what we have lost. Giving the impression that, for example, buying a Prius will prevent global warming will only provoke further despair when we realize the futility of our actions. Kingsnorth’s perspective is perhaps too extreme. Yes, a certain amount of warming is locked in and to deny that is dishonest. Given that, sustainable design is even more crucial to our continued survival as a species and to the prevention of even more widespread human suffering. But too often, sustainable design seems to elide the harsh truths of climate change and appears to be created instead to reassure us. Such projects seem to envision an infinite loop of consumption, of using a Starbucks cup while sitting on a chair made of used Starbucks cups, plastic junk begetting more plastic junk, ad infinitum, upcycled turtles all the way down. It reminds me of an old joke about an optimist, a pessimist, and an engineer. The three of them are standing before a glass of water. It is frightening to accept that the glass might be, in fact, half empty and that there is little we can do to make it full. But until we do so, we can’t conserve what little water is left. Against that backdrop, work like Livne’s, that deals unsentimentally with humanity’s future, is crucial. We cannot design real solutions to mitigate our problems until we disrupt the false, if comforting, belief that we can somehow design our way out of them.